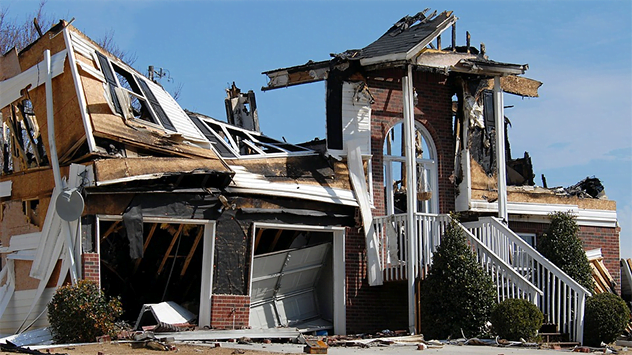 Many house fires can be preventable. Follow the tips on these pages to protect your biggest investment. October is National Fire Safety Month, and we have some tips to help you stay safe while planning for the fall fix-up season, colder weather and upcoming holidays. A survey from Erie Insurance conducted online by Harris Poll, shows one in five Americans (21 percent) admit they never clean their clothes dryer ducts, unless they have a problem. Laundry is part of life’s weekly grind. But did you know that dryers cause roughly 15,500 home structure fires, 29 deaths, 400 injuries and $192 million in direct property loss each year? The most common cause of dryer fires is failure to do a thorough cleaning. Because a lint trap is not a foolproof method for catching all the fuzzy stuff from clothes, lint can gradually build up and catch fire in the heating element or exhaust duct. You don’t have to become a statistic. Here’s how to clean a dryer vent.